"I was ordered to do this by the prime minister of Canada." Under examination by his defence lawyer Donald Bayne, the senator detailed the circumstances in February, 2013, that led to the former prime minister's Chief of Staff Nigel Wright giving Duffy a $90,000 cheque to pay his questionable Senate expenses. On the stand, Duffy said that he never intended to do anything wrong by going along with a plan to repay the expenses, and he said he never benefited from the money. Duffy also testified that had received verbal instructions from then Prime Minister Stephen Harper, that he must go ahead with it. Duffy also said Harper told him, "Nigel (Wright) will make the arrangements." The former prime minister has maintained he didn't know Wright wrote a $90,000 cheque until it was first reported by CTV News in May, 2013. The senator said, under examination from his defence lawyer, that he was getting so much pressure from the prime minister's top staffers to go on television and "repeat lines" that he would repay the Senate, that he felt like a North Korean POW. 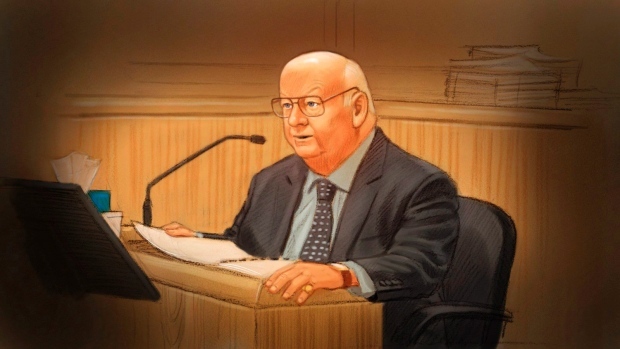 Duffy accuses Crown of "body-shaming"
On day 2 of Duffy's cross-examination, testimony briefly veered into unusual territory when the senator accused prosecutors of "body shaming" during a line of questioning about a 2009 trip to B.C. Duffy had testified that he was to make an appearance at the Saanich Fair as part of his senate business, but a photo-op with a local MP was cancelled at the last-minute. The Crown then asked Duffy if he knew a lot about the Saanich Fair, and listed some of its features -- including a giant pumpkin contest. To which Duffy snapped, "You're into body shaming now." CTV's Katie Simpson reported that people in the courtroom appeared stunned by the outburst. Judge Charles Vaillancourt then instructed Duffy to focus, and proceedings moved on. During his testimony, Duffy offered a rare, behind-the-scenes look at the activities of a sitting prime minister. Under questioning, Duffy said he thought, on many occasions, that Stephen Harper was rude. When prompted for an example, Duffy described an occasion when Harper was travelling in Prince Edward Island, and a group of seniors he was scheduled to meet were made to wait an hour, with no seating. Duffy said, when he went to investigate the delay, he found Harper sitting, eating a hot dog in his undershirt, while a female staffer ironed his shirt. Prosecutors also explored aspects of the allegations that Duffy set up a slush fund with his friend Gerald Donohue to pay for services that the Senate would not cover, including $10,000 for a personal trainer. Duffy testified that, in 2008, before he was a senator, fitness trainer Mike Croskery had worked with him to improve his own health and fitness, but they didn't see any significant results. On the stand, Duffy blamed his own genetic make-up. As a senator, however, Duffy was keen to help Canada's aging baby boomer population, so he turned to Croskery to develop a program for seniors. During his testimony, Duffy repeatedly attempted to portray himself as an "activist senator" who is devoted to serving the public. Under cross-examination from prosecutor Mark Holmes, Duffy took issue with the line of questioning seemingly designed to show that Duffy was fraudulently using taxpayer money to suit his own needs. Duffy said, at one point, that "his life is not about the money," because if it was, he would have stayed in broadcasting. "My life is about trying to do the right thing, be helpful to people and make a contribution." On day 4 of his testimony, Duffy suggested he was anticipating his return to the senate, where he would tout his idea to cut red tape for Canadian businesses bidding for contracts within the aerospace industry. Duffy, during testimony about a 2012 business meeting, when he returns to the senate, he plans to send along the proposal to the minister in charge of the portfolio.